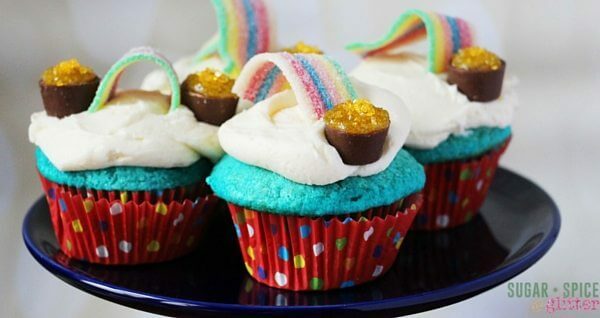 I got in a bit of trouble for not having “bluebird sprinkles” but I think I redeemed myself by suggesting we make little “pots o’gold” for the ends of the rainbows. 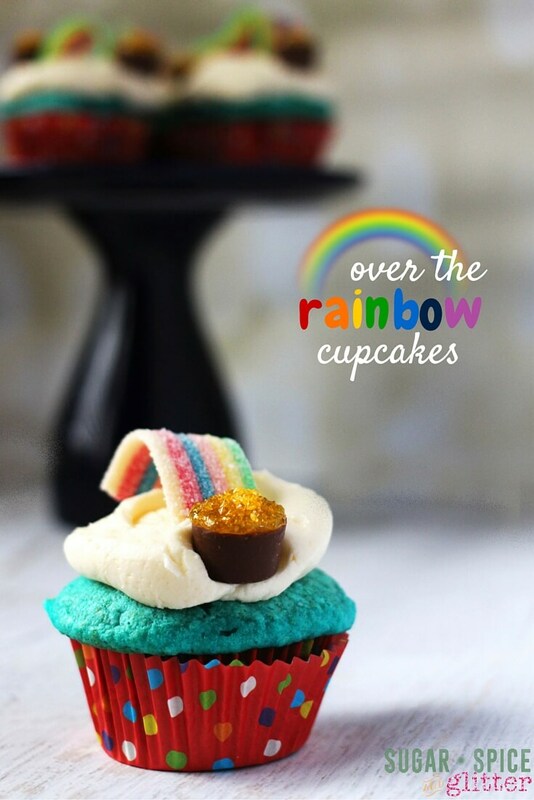 You could alternatively use some sprinkles, Skittles, whatever fun surprise you would love to find at the end of a rainbow! 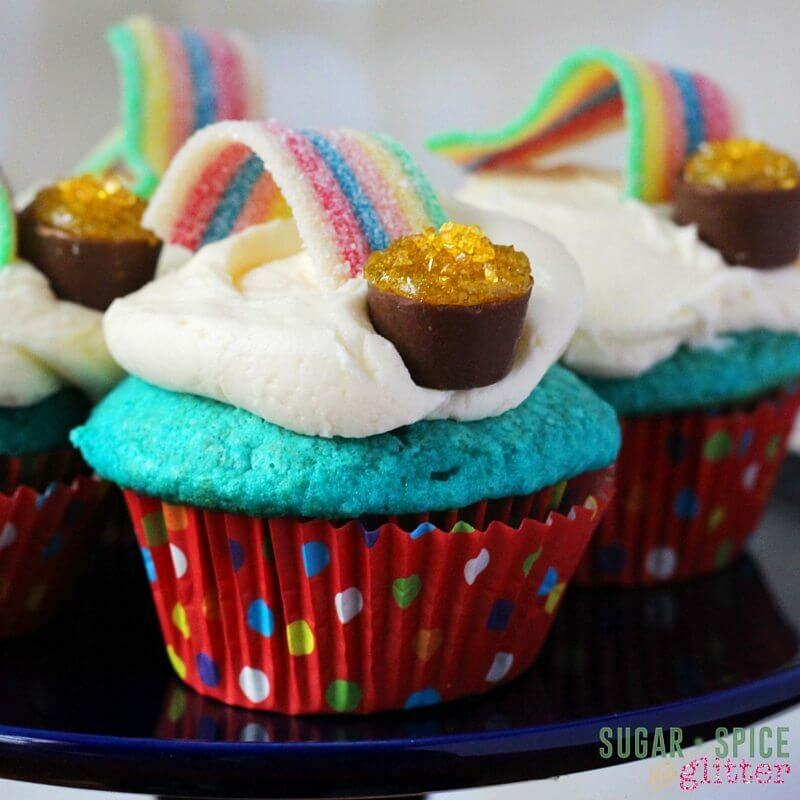 These Over the Rainbow Cupcakes are the perfect easy cupcake recipe for your child to make independently – or at least decorate independently. 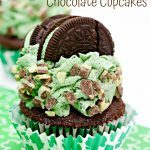 The nice thing about those “clouds of frosting” is that they are very forgiving and do not have to be perfect. 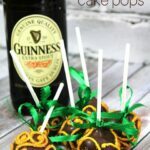 Oh – and if you’re looking for St. Patrick’s Day recipes, my Guinness Cake Pops are a special treat for the grown-ups! 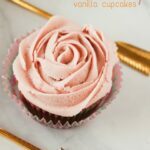 We already had the gold gel frosting in the fridge (for making Ella’s themed lunch boxes), but you can easily use a dab of the vanilla buttercream for the same purposes. Preheat oven to 350 degrees and line your muffin trays with cute liners. Cream together butter and sugar until light and fluffy, about 2 minutes. Add in the eggs, one at a time, and then the vanilla. Make a paste with the food coloring and cocoa and add to butter-sugar mixture. Use that same bowl to mix the flour, baking soda, and salt. Add to the butter mixture slowly, and then add the buttermilk and vinegar. Add salt and flour with buttermilk. Portion 1/3 cup of batter into your cupcake liners. Bake 18-22 minutes, until an inserted toothpick comes out clean. Cool cupcakes thoroughly before frosting. Cream the butter and 4 cups of the sugar together. Add the vanilla, and add more cream or sugar to achieve your desired consistency. You can use a piping bag or an offset spatula to apply the frosting – we used a combination of both to experiment, but remember, clouds come in all shapes and sizes! Swirl the gold gel frosting onto the Rolo candies (or use a bit of vanilla buttercream if you’re not using the gel). 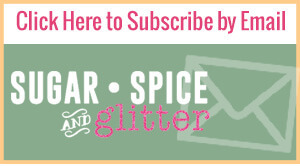 Sprinkle yellow sugar crystals generously over top of the gel and let set. 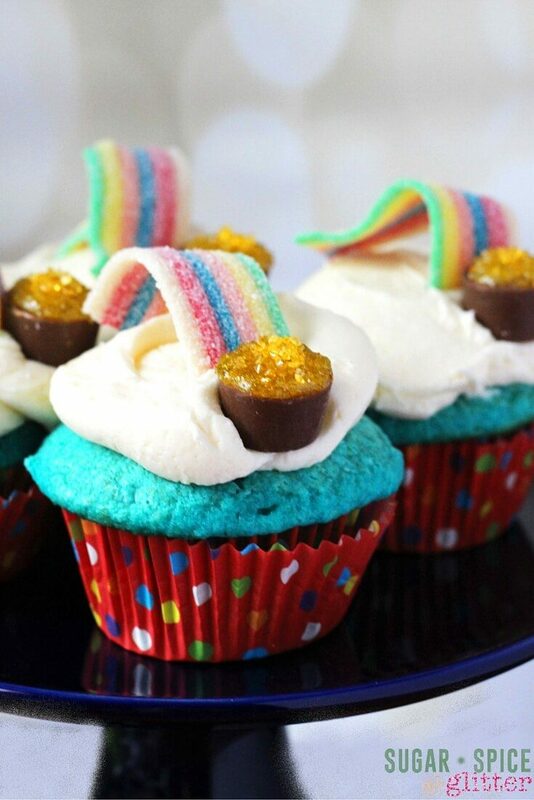 Place a Rolo candy on each cupcake towards the edge, securing it firmly with the vanilla buttercream “cloud.” Arc a small 3″ piece of the candy rainbow behind the candy, and you’re done! Preheat oven to 350 degrees F and line your muffin trays with cute liners. Cream together butter and sugar until light and fluffy, about 2 minutes. Add in the eggs, one at a time, and then the vanilla. You can use a piping bag or an offset spatula to apply the frosting. Top each Rolo candy with a bit of the gel frosting or buttercream. 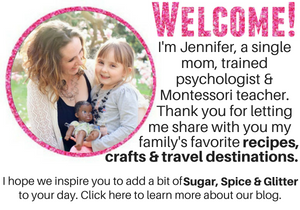 Dip into yellow sugar crystals. 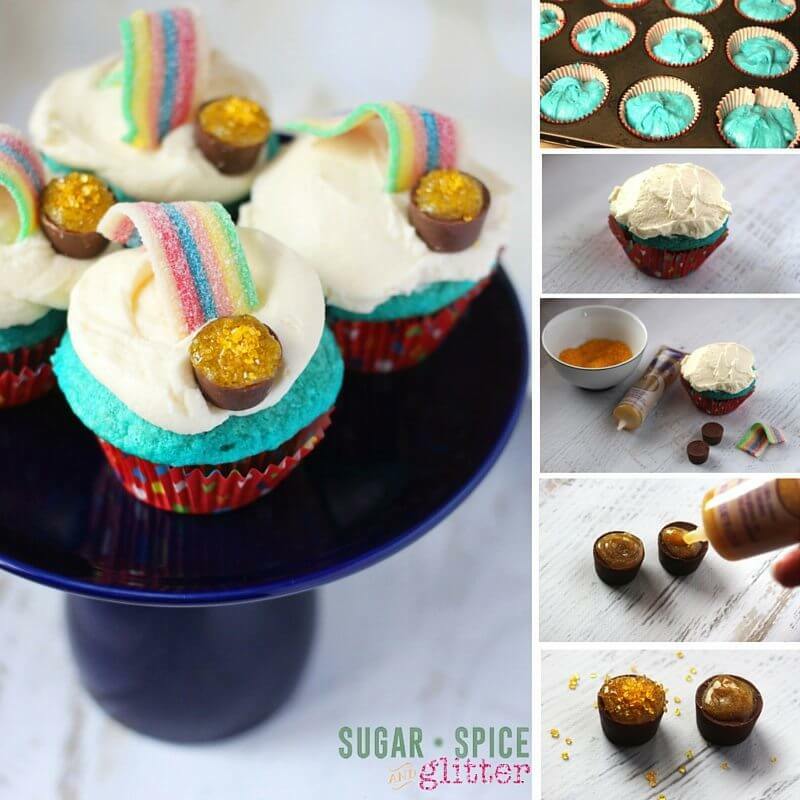 Place a Rolo candy on the edge of each cupcake and arc a 3" piece of rainbow leather behind it to form a rainbow with a pot of gold. 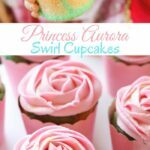 Ooh, these are just perfect for our upcoming Little Pony party! Thanks for the idea! Your daughter did a fab job they look amazing!